It’s March, and it’s about the time of year when I reach the point where I never want to see another winter squash again. I mean, I love them in soups and in grain bowls and kicky salads, but I’ve been subsisting on dark leafy greens and cauliflower and root vegetables and squash, which were exciting in October and November, for months. They start losing their magnetic appeal for me sometime around February, when I become temporarily convinced it will always be winter and Chicago will never see the sun again. But this particular winter squash recipe is special enough that I’m willing to pick up a couple of Delicatas and cook with them even when other squash preparations have worn out their welcome. It’s adapted from a recipe from Sara Dickerman at Bon Appetit, and the secret, as with so much deliciousness, is the sweet, spicy, umami-packed Korean hot pepper paste gochujang. 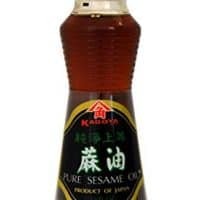 If you haven’t cooked with it and you like flavors in sriracha and miso or like Korean food, you should do yourself a favor and buy some. This gochujang roasted Delicata squash is similar in flavor profile to my sweet and spicy Korean cauliflower (one of this site’s most popular recipes and one of my all-time favorites), but unlike that dish where the cauliflower comes out of the oven and gets coated with sauce, this one is a dry side dish where the gochujang and soy sauce and sesame oil get baked into the slices of squash, permeating right into the center. It’s the sort of thing I reach into the pile and pick up and eat with my fingers, almost like a french fry. I like to shower it with a chiffonade of basil (you can use an Asian variety like Thai basil if you like), which adds a pop of color and bright flavor. The gochujang mixture is incredibly simple with just three easy-to-keep ingredients, making this an easy pantry dish if you pick up some winter squash and some basil (and if you only find sad basil you can go with some thinly sliced cilantro or scallions for a pop of greenery). It would be lovely alongside just about any protein. For vegetarians, it would be delightful tossed with some crispy cubes of tofu; for omnivores, it would be lovely alongside pan-seared chicken or pork. You don’t need to futz too much with the rest of dinner, this is the kind of side that steals the show. I make this with Delicata squash, which I love in part because they’re little and cute and in part because their skin is so tender it doesn’t need to be peeled, but you could use any winter squash here such as butternut, Kabocha, acorn, Red Kuri. If you use butternut or Kabocha, you’ll probably want to peel it before roasting (some people eat the skin on those, too, but personally I find it a tad thick). 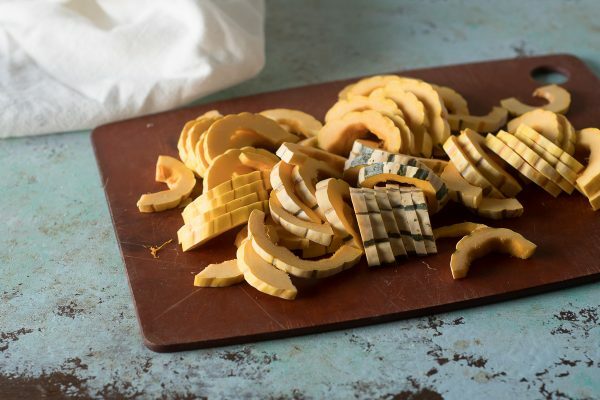 It’s a great way to bring new life to any winter squash. Gochujang is a delightful Korean hot pepper paste. It's thicker, sweeter, and more umami-packed than something like sriracha or sambal oelek (which won't work as substitutes here). You can use any winter squash you like. 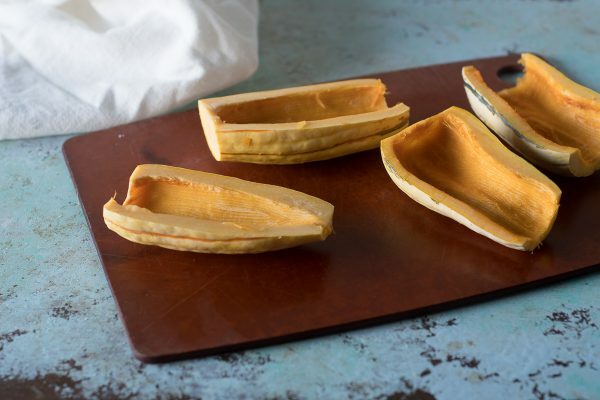 Delicata is nice because two of them are the perfect size to fill a half sheet pan and they don't need to be peeled, but a medium butternut squash or equivalent amount of Kabocha, acorn, carnival or similar squash will work here. If your winter basil is looking too sad, you can top it with thinly sliced cilantro or scallions instead. Preheat oven to 425°. Line a baking sheet with aluminum foil (optional, but nice for cleanup). In a small bowl, whisk together the oil, gochujang, soy sauce and sesame oil until smooth. 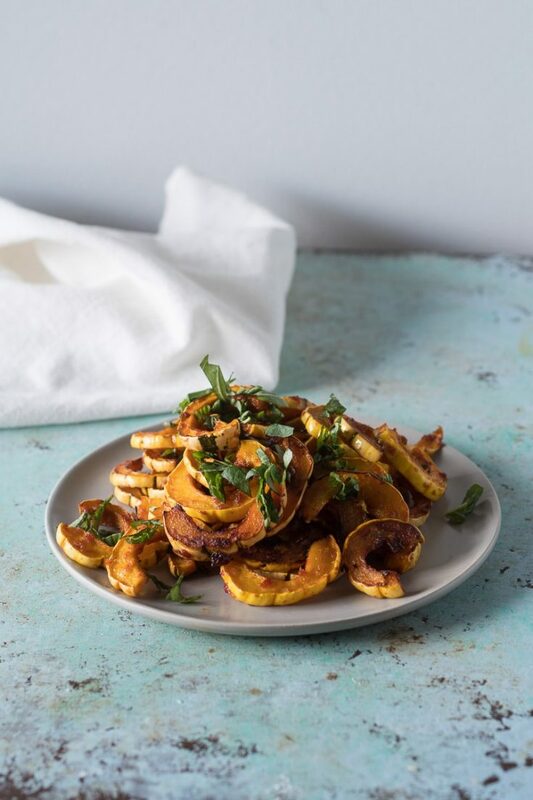 Place the sliced squash in a large mixing bowl and toss with the gochujang mixture until evenly coated. 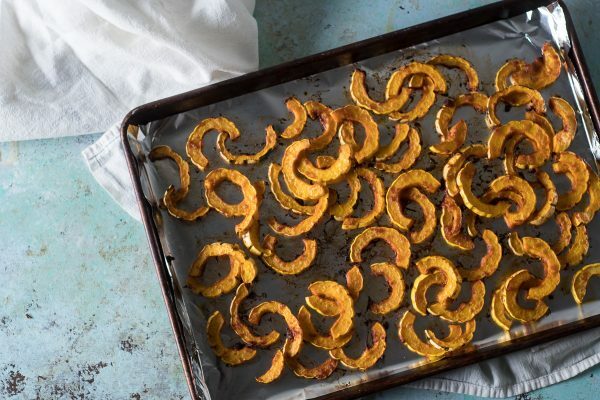 Place the squash in an even layer on the baking sheet and roast until tender and browning at the edges. Transfer to a serving dish and top with basil. I’m not super familiar with Korean foods, and therefore I’ve never heard of Gochujang before. 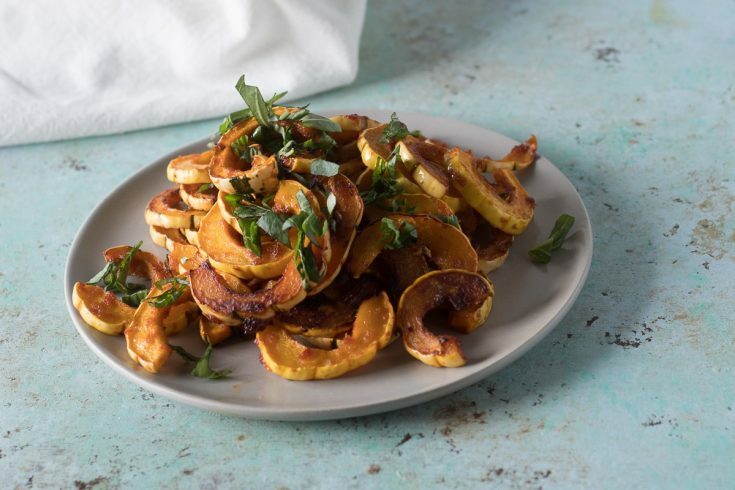 This dish looks great, especially since I’m a fan of delicata squash. I love learning new stuff like this! Thanks! 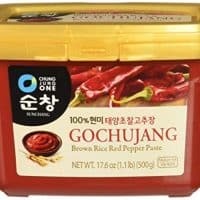 You should totally try gochujang! It’s one of my favorite ingredients to play with and it makes everything more delicious! I don’t ever get to the point where I don’t want to see winter squash again! I am so tempted to put them in all my recipes year rounds. I just love how sweet and creamy and filling they are, and so healthy! I live where we get pumpkin year round as a local crop (tropics), and my husband gets so tired of it! This delicata looks delicious, and the spices sound wonderful. Michelle, I’m jealous of your abundance of local produce! I only get sick of it because there’s so little local stuff to choose from around here this time of year! As someone who a) adores gochujang, and b) is also getting a little tired of the same old squash recipes, this is a breath of fresh air. It certainly doesn’t hurt that it looks amazing either! I don’t use gochujang enough with vegetables, and I must say you’ve really piqued my curiosity. Thanks! I think this will be right up your alley! Gochujang can do wonderful things with vegetables. We just got more Delicata in our CSA box, so I’m happy to find a new riff on preparing it! I’m so glad I could help! 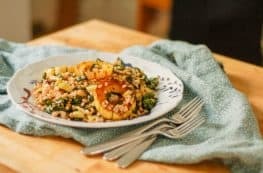 Delicata is one of my favorite winter squash! What a fun and healthy recipe! This looks amazing! I love winter squash and I love roasting my veggies so this looks so awesome to my weekend addition.. definitely going to try. Thanks, Veena! I hope you love it! Followed this recipe completely and it didn’t turn out great. Really was hoping for the best since I love all types of squash, but it just didn’t hold up that well. So sad. Huh, I’m sorry to hear that.